Winter has returned to Edmonton. It’s absence had been much noted as week after week passed with little or no snow and daytime highs above freezing. It had felt like Spring for so long that I had almost deluded myself into thinking that it really was. During the mild weather I was actually missing winter. As a cyclist, my rational mind knew that this was foolish thinking. Bare pavement and temperatures not prone to causing frostbite are a good thing, aren’t they? 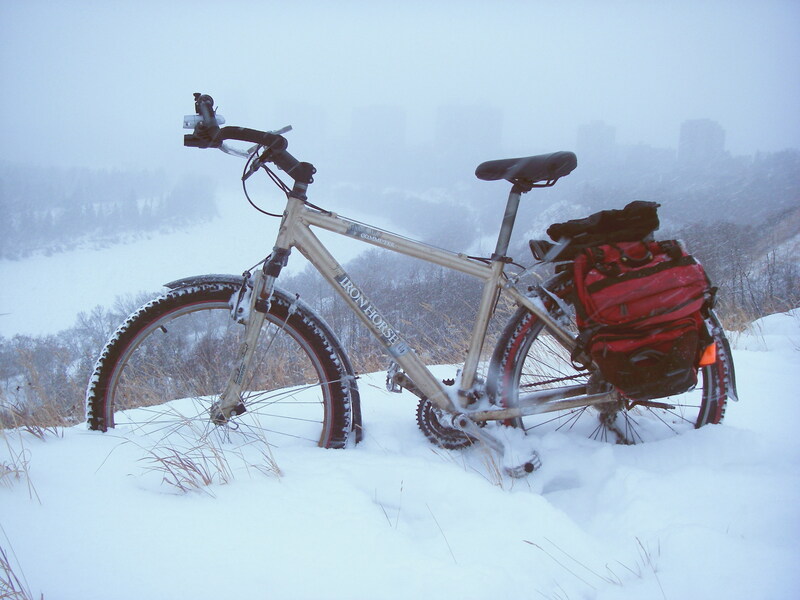 Still, I missed the frosty beauty of deep Winter: sparkling fresh snowfalls, the squeaking crunch of packed snow, the unreal clarity of the bone dry air, and the satisfaction of successfully pedaling through the most adverse conditions. Instead, there was an endless dirty Spring.The roads alternated between long, gritty stretches of salty sand and stubborn patches of rutted ice. The long stretches of bare pavement tantalized me with the possibility of riding one of my fast bikes while the lurking ice hazards denied me any real ability to do so. 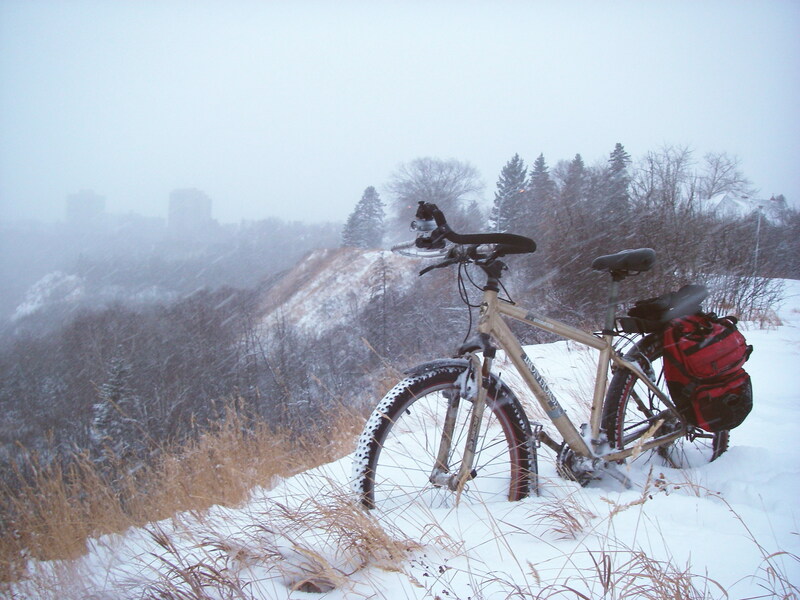 I became accustomed riding my mountain bike to the ticking accompaniment of my studded tires. Two days of steady powdery snowfall have changed all this. This prairie city is once again a winter wonderland. 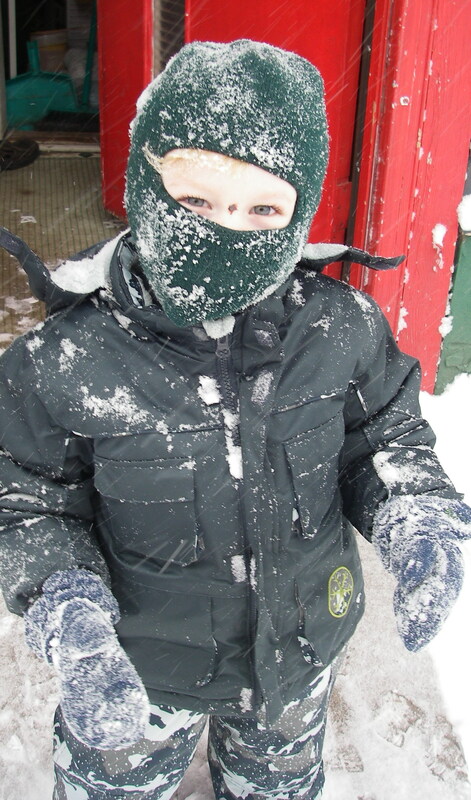 I do miss the warmer weather, but I will enjoy the snow while it lasts. 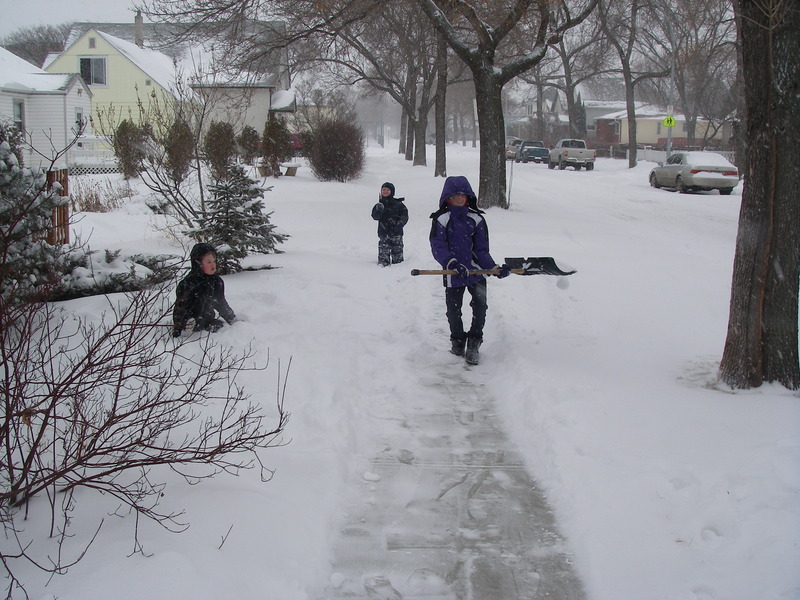 On Saturday, the first business of the day was shoveling clear the paths and having a bit of family fun in the snow. I efficiently combined the two activities. A Canadian Stand-off: Snowball wielding photographer versus a loaded Snow Shovel Catapult. Much later in the day, after other duties were attended to I was finally able to get out for a little bike ride. Dusk was fast approaching and the flurries were thickening. As I headed out on the road I felt like I was piloting a river boat as I churned through the deep snow spinning in true paddle wheel fashion. The foot deep undisturbed, powdery snow was easier to travel through than the places that were somewhat packed down by cars. The semi-packed snow breaks as one rides over it requiring constant steering corrections to maintain something resembling a straight course. At several points I unabashedly retreated to the sidewalk to avoid traffic. You cannot assume that drivers can control their cars in these conditions. I headed to my favourite local park overlooking the river valley for a little photo session. By the time I returned home I was becoming overheated and my legs were feeling a bit wobbly. Riding in this sort of snow is quite the workout and I’m glad I wasn’t in a hurry to get anywhere. I also took along my inexpensive bike-cam on this ride. I don’t do this very often as I find most videos I take are boring to watch even for me. On this day it seemed worth it. I like the way that the video frame rate syncs with the wheel rpm to create the illusion of an unmoving front wheel. Also, the constant steering corrections cause the handlebar mounted camera to make it appear that the rear end of the bike is fishtailing wildly.You can see my terrible middle-of-the-foot pedaling technique. I only seem to do this on this bike and only when the riding surface is particularly unstable: I like the way my boot heel rests firmly against the pedal. Finally, I have included what I hope is a mercifully brief amount of Nostril-Cam. The public domain music (“Winter”, Billy Murray, 1911) was sourced from the Free Music Archive, uploaded by The Cylinder Archive. WARNING! Watching this video may cause motion sickness. In recent years I have increasingly become a vintage bike sort of guy. There several reasons for this. One is that I am, by necessity, quite frugal: the amount of disposable income that I can divert towards bike related purchases is not as large as I would like. With patience and persistence it is possible to find good quality old bikes for reasonable prices. Take for example my $50.00 Apollo road bike that I bought last summer. Another reason is utility. While the technology of bicycles (and bicycle marketing) marches relentlessly on, in many cases these old bikes still perform their intended function with aplomb. A nice English 3-speed remains a great bike for everyday practical, comfortable riding and with only moderate attention will last for generations. In the 80’s there were vast numbers of sport and touring road bikes manufactured and sold and many of these are beautiful machines that are a joy to ride. My ’83 Nshiki touring bike is easily the match of new touring bikes such as the Surly LHT. This is not to say that I don’t appreciate newer bikes. My ’08 Kona Jake is a great bike and has handled everything I have thrown at it over the past couple of years (except for that rim destroying hole I hit at top speed this past summer. Sorry Jake.) There is a fantastic array of excellent new bikes out there for all types of riding. If I were any sort of competitive cyclist or a semi-serious mountain biker I would consider the technology emibodied in the new bikes to be essential. However, my needs are simple and for my commuting and utility riding my little fleet has sufficed. The Troll is a mountain bike with multiple personality disorder. 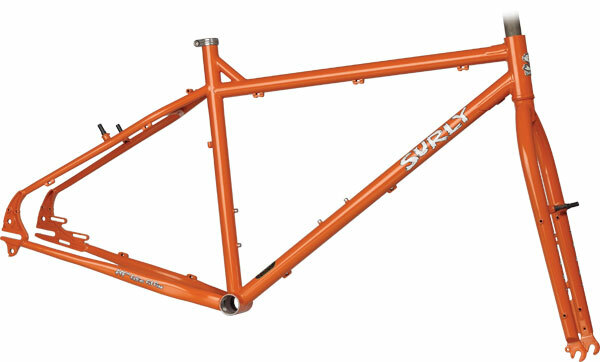 It’s geometry is similar to Surly’s well regarded 1X1 but it has a lot more build options. Disc brakes? Yes. Cantis? Yes. Rear Derailleur? Yes. Internally geared hub? Yes. Rack and fender bosses and eyelets? Yes. It has frame clearance for 26 X 2.7″ tires which doesn’t quite make it a fat bike but that’s still pretty dang big. The rear dropouts are bizarre looking but laden with possibilities. I particularly like that it is designed to accept a Rohloff hub axle plate although realistically it will be a long time before I could afford one of those expensive marvels of engineering. I also like the holes for attaching a trailer. 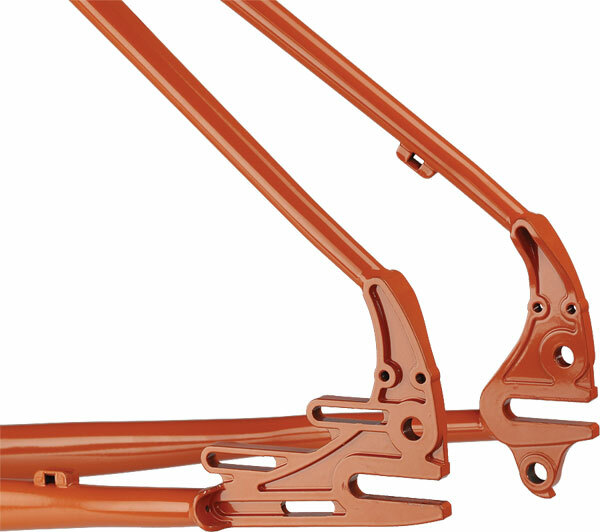 I am already mulling over new designs for my cargo trailer hitch with this frame in mind. I have almost convinced myself that I need this frame. I could build it up into a pretty decent all round bike with the parts I already have on hand and upgrade at my leisure. It’s an excellent bike for a chronic tinkerer like myself. In different configurations I could use it in a variety of ways: utility bike or rough-road bike camping in the summer and fat tired snow riding in the winter. It will take a little while for me to save the cash but I think this may be my next acquisition. While researching the Troll I came across an excellent blog that demonstrates the capabilities of the Troll. If you have any interest at all in expedition touring I recommend reading While out Riding. Specifically, there is a thorough Troll review. Not even winter can stop the inexorable growth of my small bike fleet. Last week saw the arrival of a circa 1977 Raleigh 20. There has been an awful lot written on the internet about the Raleigh 20, so I am feeling serious lack of motivation to write much here. 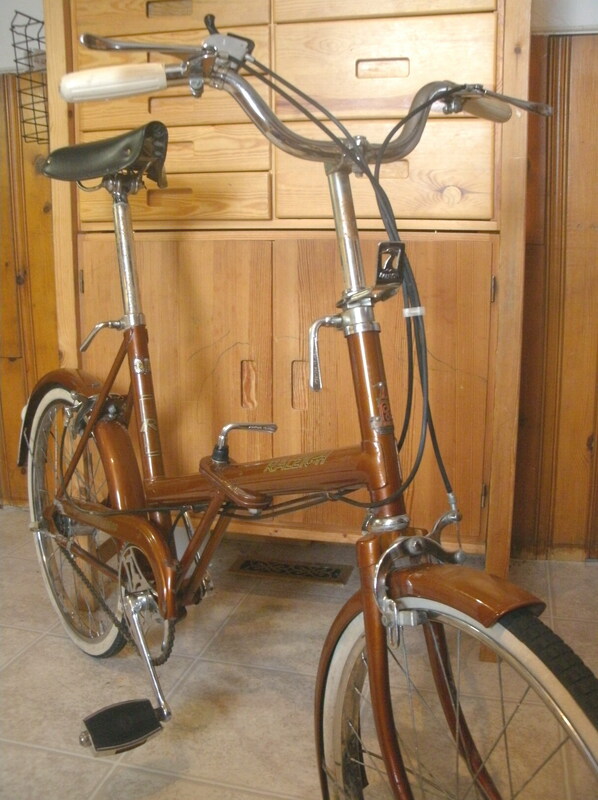 In brief, the R20 was a small wheeled (20″) utilitarian bike produced by Raleigh from ’68 until ’84. Some were folding bikes and some were solid frames. There were even a few tandem 20’s produced. 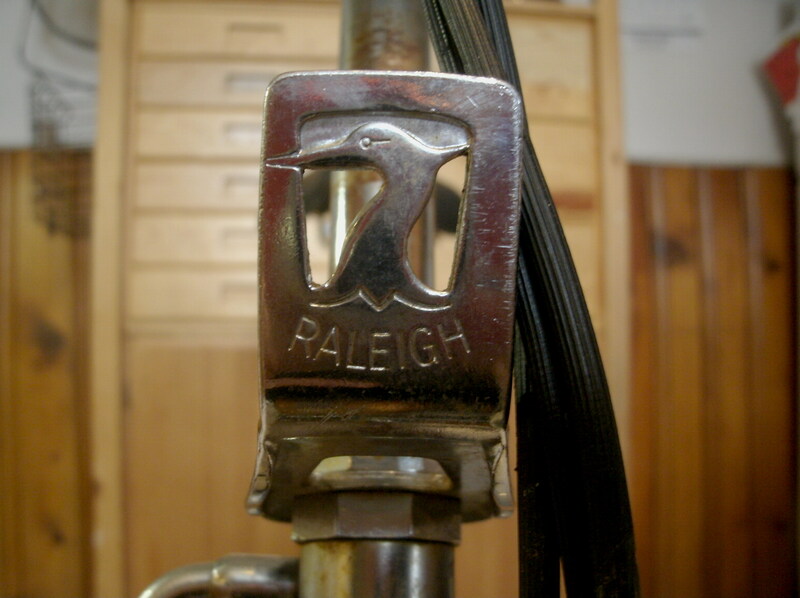 Although certainly it was certainly a good seller for Raleigh it was not a prestigious bike. However, in the ensuing years the R20 has come to have something of a cult following. This can largely be attributed to the late Sheldon Brown, bicycle guru and internet writer on all things bicycle. Sheldon was a R20 fan and spread the word of the bike’s virtues. 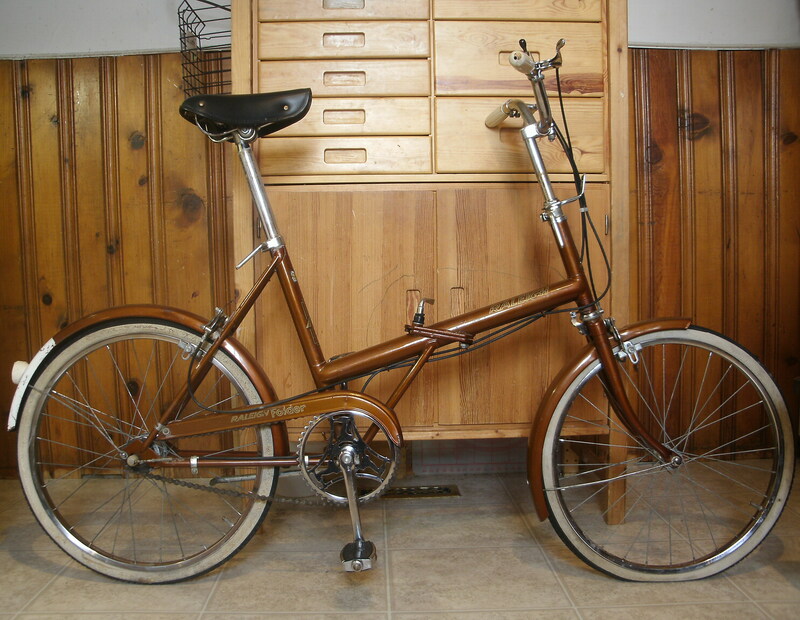 The R20, unlike many of the folding bikes from the same period, was very solidly built and handled much more like a full sized bike. The well made frame is a boon to anyone wishing to modify and modernize the R20. The internet is awash with examples of modified 20s. I’ve been interested in folding bikes for some time now. Several years ago I bought an ’80s era Dahon V. In many ways, that was a very bad bike, with a rickety, creaky ride and twitchy steering. However, the folding capability and the ride was good enough to make me want to keep looking for a folder that suited me. There are some fantastic folding bikes being made these days, but the good ones are rather expensive. I really couldn’t justify one for the small amount I would use it. When I read about the R20, it seemed to suit both my budget and my functional criteria. Since then I’ve been patiently waiting for one to show up for sale locally. When I spotted one for sale last week on Kijiji I snapped it up. 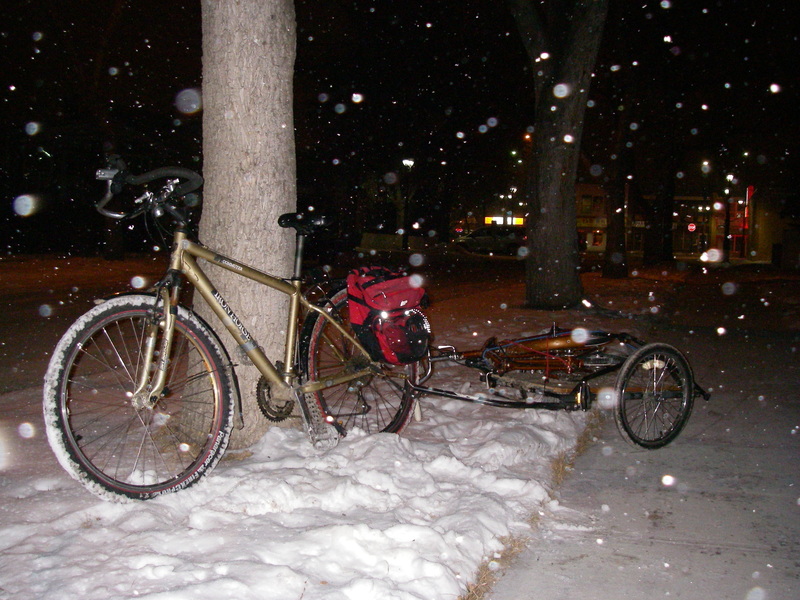 The folded R20 arrives home by trailer on a snowy January night. The bike is in quite good condition and appears to have seen very little riding. One advantage of the “coffee” paint colour is that the few scratched rusty places don’t stand out. It will still need a bit of TLC to get it into smooth operating condition. As near as I can tell the components are all original. 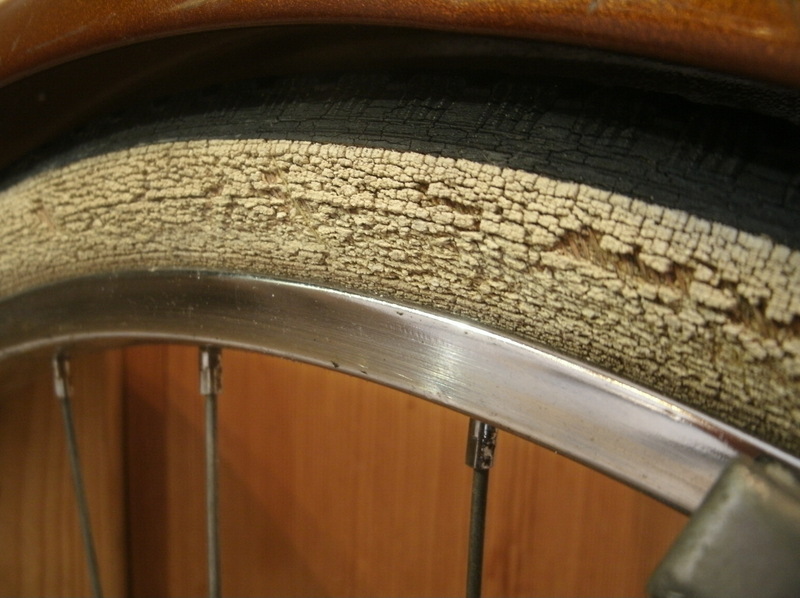 The tires are almost certainly original and will have to be replaced before I can even take the bike for a test spin around the block. Unfortunately, this bike has 20 X 1 & 3/8″ wheels and tires that size are uncommon around here. Luckily, when I was at Bikeworks today I scrounged up a used pair that will do for now. I think they are actually wheelchair tires. Not going anywhere on these tires. My plan right now is to ride the bike for a little while before deciding on any upgrades or modifications. I really like some of the modified 20s I’ve seen online but the bike has a lot of charm just the way it is. 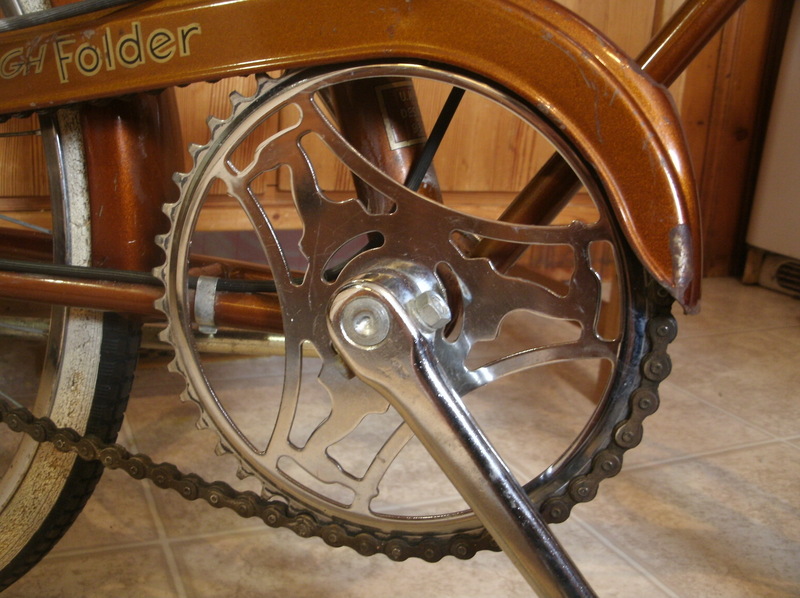 One change that many people make is to replace the cottered cranks with the square taper variety. However, I do like the Raleigh Herons on the chainring so I may not go that route. Wheel upgrades? Improved headset? All these decisions will have to wait for now. There is a great resource for all this information over at “The Raleigh 20“. The internet certainly is a boon for these sorts of projects. Without it I wouldn’t have a clue where to start. For a great example of how far you can take a project like this check out this page by a fellow Edmonton cyclist the Raving Bike Fiend. And now I think I’ve spent enough time writing about this bike. Instead, I will be spending some quality time in the garage pulling wrenches and hopefully some time riding shortly thereafter. I love the spinning Herons! Yet another Heron! This one has an eye.